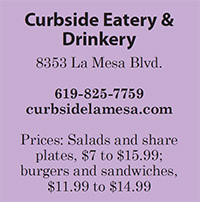 Brick and metal-pane windows, which open to the street, give the impression Curbside Eatery & Drinkery has been a longtime fixture on this corner of La Mesa Boulevard and Third Street. 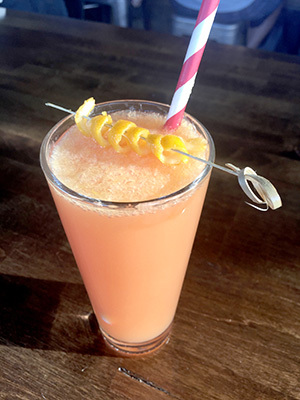 With plenty of outward seating and an infectious bustle inherent to modern-day gastropubs, its recent arrival (along with the new Surf Rider Pizza a few doors down) delivers a hardy gust of urban life to the heart of La Mesa Village. The freshly remodeled structure used to house Blumenthal Jewelers, which moved to nearby Date Avenue. It was taken over by Jonathan Baron and four silent partners. Baron also co-owns the successful Regal Bar across the street. In comparison, Curbside is his sophisticated, family-friendly venture bearing a focused food menu that rises to the occasion of well-conceived cocktails. The intention, says Baron, “is to master what we do.” In other words, he isn’t interested in bombarding us with dozens of meal choices. A “La Mesa Margarita” accented smoothly with Grand Marnier, lime and agave coincided with a starter of short rib nachos made with freshly fried tortillas chips. A big cut above your everyday Sunday-football variety, these were visually chaotic but tasted cohesive with their multiple sauces of cilantro cream, achiote, and IPA beer cheese. 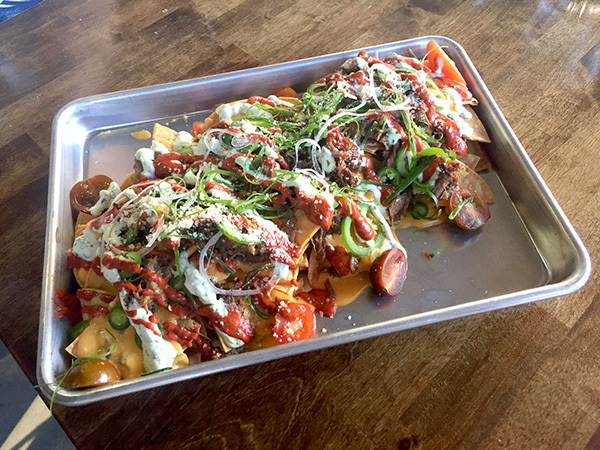 Add a mix of blistered shishito peppers, thinly sliced jalapenos, and extra-tender short rib meat, and you’ve arrived to nacho heaven. We sated our hankering for fried vittles with an order of beer-battered cauliflower and onion rings, the latter of which serve as circular bases for large pieces of the cauliflower. Both vegetables sported a light batter and came with a trio of obligatory dipping sauces: ranch, barbecue-ranch and mild Thai chili. As we progressed further into the short menu, my companion switched to a newfangled type of mimosa that bar manager Andrew Pringle calls “Sunrise on Palm.” The vivid drink features Italian elderflower liqueur, orange curacao, dry Spanish cava, fresh orange juice and a splash of cranberry juice. Its complexity and intriguing acidity rivals anything slung at Sunday brunches. Helming the kitchen is executive chef Ryan Napuli, who previously worked as sous chef for True Food Kitchen and Coasterra, both in San Diego. He revealed the menu will change slightly in the coming weeks with the additions of a chicken-avocado sandwich, a mushroom-Swiss cheese burger and made-to-order doughnuts for dessert. We stuck to items that will remain largely intact, such as the “gourmet burger” and grilled veggie sandwich. The burger was a half-pound monster earning its “gourmet” title with two slabs of melty brie cheese on top, plus bacon-onion jam as the condiment, and a praiseworthy brioche bun from San Diego-based Sadie Rose Baking Company (my favorite wholesaler of breads and rolls). The veggie sandwich my companion chose was served on crisped sourdough. It gave a starring role to portobello mushrooms, which were cut a little too thick in the bite I tried. Nonetheless, the flavor combination of red peppers, onions, arugula and creamy Dijon was anything but boring. 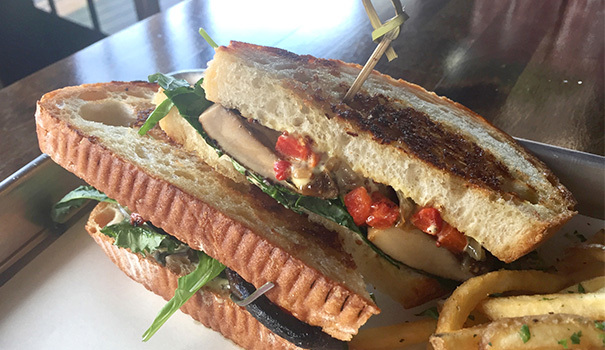 The sandwiches come with skinny french fries in a choice of flavors: garlic, Parmesan or truffle. We chose the latter two versions without regret. Other popular items include Angus sliders, ahi poke, tostadas with ahi, steak or mushrooms, and a short rib “melt” with cheddar on sourdough. The drink list is also rather concise, but covers all bases with 12 taps of domestic and craft beers; a handful of cocktails with classic roots; and a tempting selection of wines hailing from Napa, Europe and New Zealand. 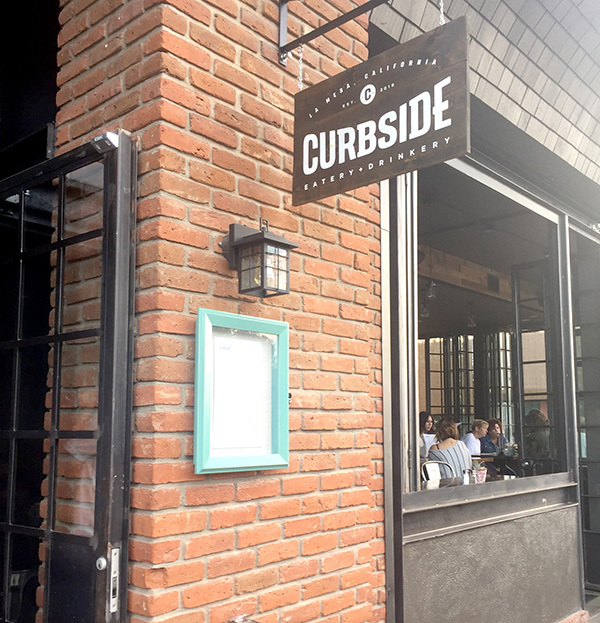 At less than two months old, Curbside Eatery & Drinkery is off to a steady start with a well-trained wait staff in place and prospects of happy hour and weekend brunch in the pipeline. —Frank Sabatini Jr. is the author of ‘Secret San Diego’ (ECW Press) and began his local writing career more than two decades ago as a staffer for the former San Diego Tribune. You can reach him at fsabatini@san.rr.com. Tags: CurbsideCurbside Eatery & DrinkeryFrank SabatiniFrank Sabatini Jr.